RIMRA secured a launch site a 3000ft x 1500ft sod farm located in West Kinston Rhode Island. The field owned by University of Rhode Island and operated by a private farmer both of which have granted approval to launch at . We are a low-power and high-power club and can fly any rocket to 1,500 feet. Anything over 1,500 feet to 3,000 feet we need clearance from TF Green’s tower who has final right of refusal. At this time, launches will be held monthly on second Saturday of each month, with Sunday reserved as a Rain Date. Launch dates will be posted to the Calendar along information. When the field is wet the farm manager wants us to stay off the field with cars. So parking will need to be in the spots at the farm buildings or along what appears to be a horse riding ring just north of the buildings. We all will have to walk in from there. 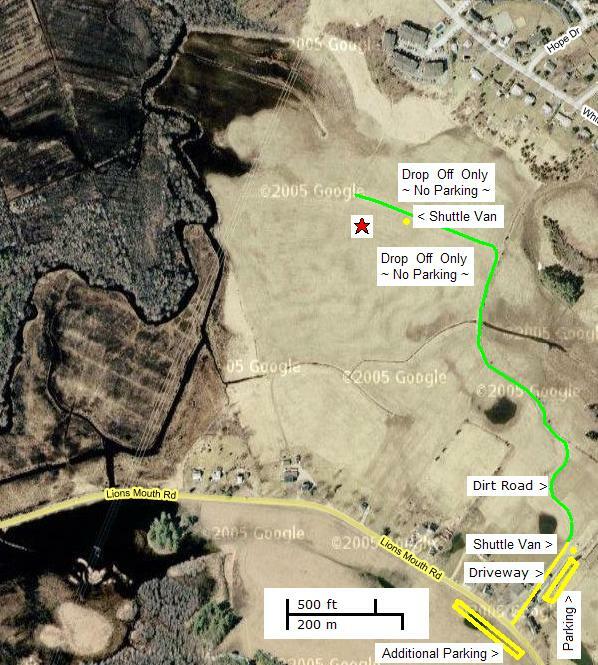 The launch site is located on University of Rhode Island Property. The Launch field is located across Rt138 from the University of Rhode Island’s Ryan Center parking lot at the end of Peckham Farm Road. From the South Take I-95 North to Exit 3A (Route 138 East). Continue east on Route 138 for about 11 miles to the University past the outdoor marquee and Boss Ice Arena. Turn right onto Peckham Farm Rd. From the North Take I-95 South to Exit 9 (Route 4 South); follow Route 4 to Route 1 South. Stay on Route 1 until the intersection of Route 138 West. Turn right on Route 138 and travel for about 6 miles. Go straight past Upper College Road where you see the Large University of Rhode Island stone wall. Continue for about 1/3 a mile and then turn left onto Peckham Farm Rd. This is the primary launch field for the Maine Missile Math and Science Club. The club must reserve and pay for the use of the field for specific dates for launches. Any casual launching at other times is by permission of the Harvard Turf Farm, and does not involve CMASS or MMMSClub. Please note: the maximum speed on the Turf Farm dirt road is 10 mph. HUBBARD ROAD IS OPEN AGAIN. going under Rt 16 and then on to Rt 16 north. Continue on up the Spaulding Turnpike (Rt 16) to exit 16, the Rt 11/Rt 202 exit. Keep bearing right towards Sanford ME and Rt 202 east. Follow Rt 202 east to the NH/ME border. There will be a Cumberland Farms on your right at the four way stop, just before the border. Hubbard Rd. The Tuckahoe Turf Farm will be on your left (2.9 miles). The club must reserve and pay for our use of the field for specific dates for our launches. Any casual launching at other times is by permission of the town of Sudbury, and does not involve CMASS. This field is owned by the town of Sudbury and managed by their recreation department. It is located on the south side of Rt 117 (North St) between Sudbury Rd and Pantry Rd. There is a sign at the entrance to the parkiing lot off Rt. 117. Here are some pictures of the field and the entrance: Pictures of Davis Field. You can find the field on a map (e.g., Switchboard or Google) by searching for: "200 North Rd, Sudbury, MA". Take Route 117 east, thru Maynard into Sudbury. Go thru the light at Pantry Road on the right and then just past Windmill Drive. 500 feet down you will see the parking lot to the field on your right. Take Route 117 west thru Lincoln into Sudbury. Continue thru the light at Sudbury / Concord Road past the Nashawtuc golf course on the left. Go aprox 1.5 miles and just past Northwood drive on the right you will see the parking lot on the left. Take I-495 to Rt. 117 East. Follow Directions from the West. Take exit 29B to merge onto Cambridge Turnpike/RT-2 W toward Acton/Fitchburg. After 3.5 miles turn left to stay on RT-2. Go 2 miles and turn left onto Sudbury Rd. Follow directions from the East. Take exit 26 to merge onto US-20 East toward Waltham. Stay to the right to go towards Waltham (not back over 128). Go 1/2 mile and take a Sharp left at Stow St.
Go aprox 8 miles and follow the directions from the East. The club must reserve and pay for our use of the field for specific dates for our launches. Any casual launching at other times is by permission of the town of Acton, and does not involve CMASS. These fields are owned by the town of Acton and managed by their recreation department. They are located just south of Route 2 near the Acton-Concord line. The fields are visible from Route 2. You can find the fields on a map (e.g., Switchboard or Google) by searching for: "341 school st, acton, ma". Take Route 2 east, past the Newtown Road and Rt. 27 exits in Acton. Make a right turn onto School St. The soccer fields are on the left just before the houses. Continue all the way through Concord, past the rotary next to MCI Concord. The next traffic light is 2 miles west of the rotary. At that light (Piper Rd.) and make a U-turn back onto Rt. 2 East. Take the second right onto School St.
Take I-495 to Rt. 2 East. Take Rt. 128 to Rt. 2 West.